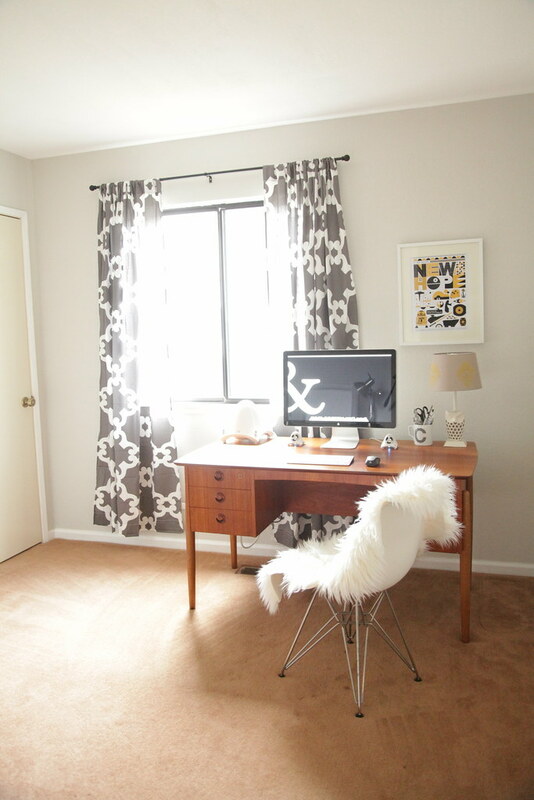 I’ve been busy getting my office room organized and decorated so I could snap some photos of it. I’ve also managed to get the other side of the room (the one I’ve been avoiding taking pictures of since I painted it) tidied up as well. 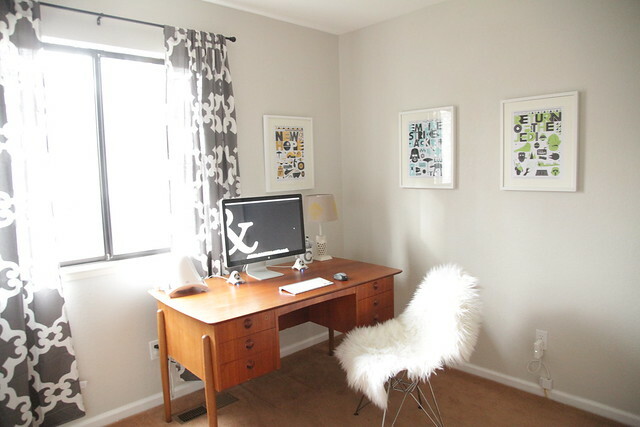 The desk is an authentic a mid-century modern Danish desk I inherited from my grandpa. I donated my old computer chair as it was too wide for my new desk causing me to always hit my knees against the edge of the desk. I waited for the Herman Miller sale last November and got a white Eames Molded Plastic Chair. Not only does it fit perfectly under my desk, but it’s super comfy for my back. I also got a nice sheepskin cover from HomeGoods to drape over it during the winter. 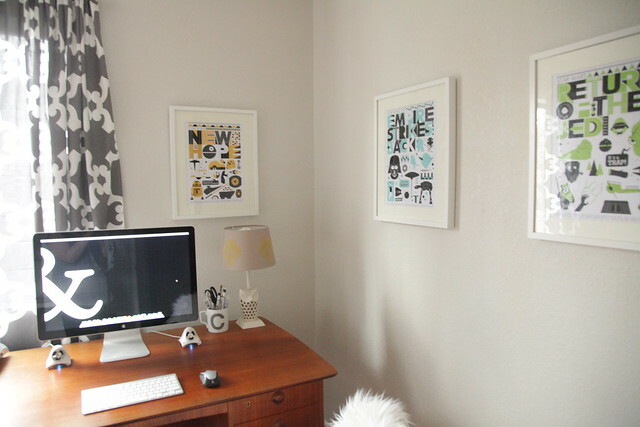 The three Star Wars posters are from ReStyleshop by handz on Etsy. I absolutely love them! I traded in my yellow chevron curtains for the Montecito Panels from ZGallerie. The other side of my office has my lightbox, which is made from a 30 gallon clear plastic container, some white paper, and two lamps from Target. Next to it my Star Wars figurines are on display in an IKEA BERTBY case. 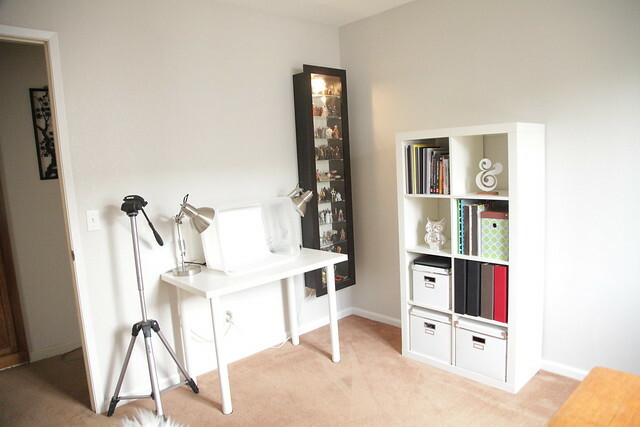 The white IKEA EXPEDIT shelving unit adds extra storage for my books, decor, supplies and scrapbooks. Your office is looking great! 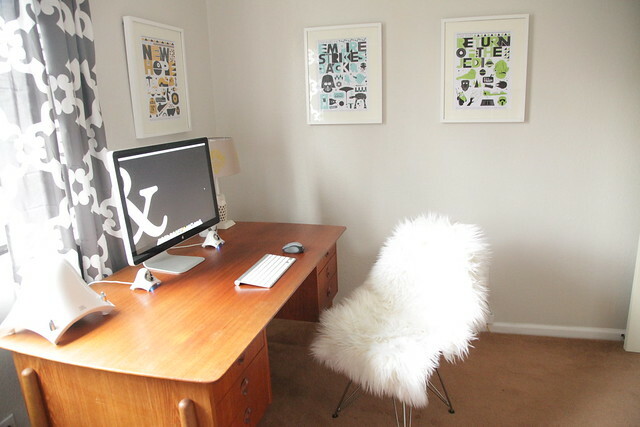 I love how well the Eames chair fits with your desk. The curtains are also a great addition. 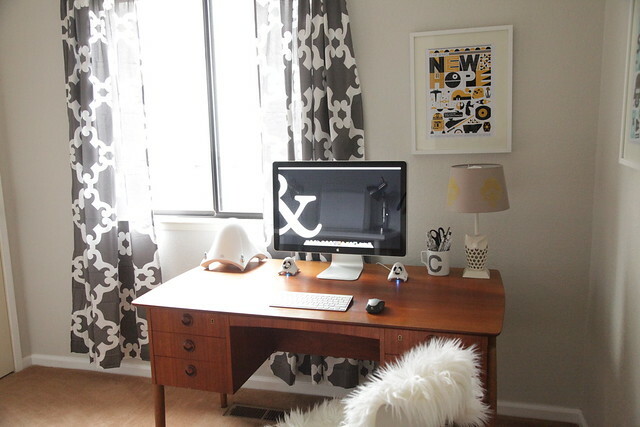 I love that you have dark curtains but still have tons of light in your office. Thanks for sharing! I arrived here via Lifehacker – may I ask, where is your computer located and how is it connected to the display? I am going to upgrade this year and am on the fence between an iMac and a MacBook Air or Pro with a Thunderbolt display, so I’m wondering if there is some sort of mount to hold a laptop on the back of the display? Hi Brett! Thanks for stopping by! I have the BookArc Stand by TwelveSouth that my MacBook Pro sits in on a shelf on the back of my desk. I have the Apple Cinema Display from 2010 as well as a 2010 MacBook Pro, so I use the cords that came with the display to connect to my laptop. It’s pretty easy. Hope that helps answer your question. Thanks for letting me know, I couldn’t quite see in the pictures (smartphone screen…) so I figured I’d ask! And my pleasure to drop in, you have a nice site here. I am familiar with the BookArc (Twelve South makes nice products), so I’ve been considering that. I may also look at the AluRack from Just Mobile as an alternative – or get both, as my 2008 MacBook Pro still works but is getting slow, hence the upgrade. Thanks again and have a great day – I’m going to have a look around here to see what else you have! Are the pictures above of the office where all of this magic you share with us is created 🙂 ? If only i get my home office that neat and organized, maybe i could get my thoughts out and share them with the masses like you! However, i’m stuck in a pile of old junk and clutter and don’t know where or how to begin… The next rainy day in my area will be spent throwing away old junk and getting my home office cleaned up a little bit. 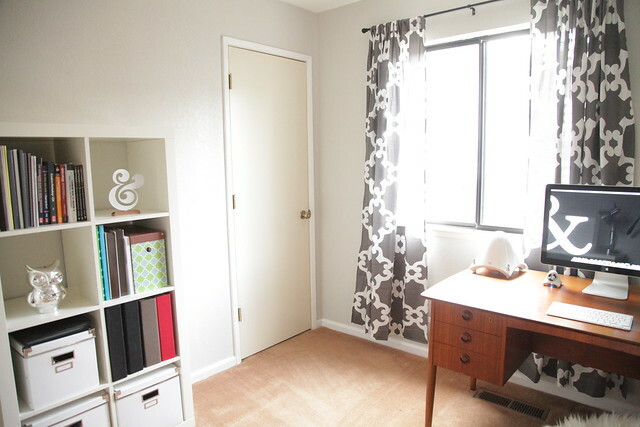 After I stop my hoarding, I’ll be able to set up a nice and clean home office like yours. I believe that having all of that free and organized space (as opposed to having to walk through a booby trap every time you want to get work done) leads to a creative and open mind.